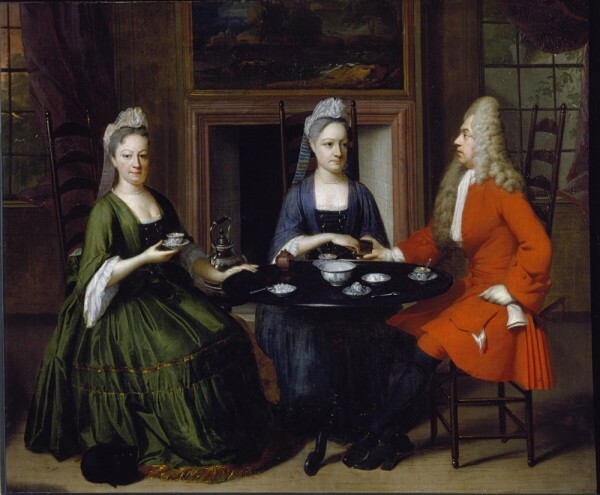 The 1715 oil painting, Two Ladies and an Officer at Tea, (above) has often been used to cite the prominent place that tea held in elite society of the early 1700′s. For tea social history enthusiasts, it is a quintessential image, one of the earliest to depict the partaking of tea in the western world. It is part of the Victoria and Albert Museum’s vast collection. While researching for a talk I gave on history of tea ware 5 years ago, I used this painting to illustrate the upper class perspective on tea in that era. On the slide caption, I credited the artist as Nicolaes Verkolje, Dutch (1673-1746). When I updated my talk this January for the Toronto Tea Festival, I noticed that the V & A had revised their details about the painting, now stating that the artist was ‘unknown’. They mention that the painting was formerly attributed to Verkolje, but on further examination, it was believed to be British. The red coat on the officer was possibly a clue. Within those 5 intervening years, the museum had also improved the digital upload quality of the painting’s photo and I started to notice many details that I had previously overlooked. Let me lead you in a closer look. At the outset, it can be said that whoever painted and whoever were the subjects, this portrait was commissioned to display not only the wealth of its sitters, but also their undeniable awareness of the fashions of the day. They could afford these amusements and wanted their circle of friends to admire that about them. The portrait contains many indicators of their affluence. Some of you will know that before I switched careers to become a tea sommelier 10 years ago, I spent over 20 years working in the fashion industry, styling and adorning clients for their big moments on camera and on the red carpet. Whenever I have a chance to find a connection between the subject of tea and costume/fashion I feel quite giddy. It might be that the confusion around the provenance of this portrait is related to the women’s clothing. It all looks quite European, particularly the head pieces. The ‘Frelange’, was a trend of the day, the way fascinators have occupied the heads of wedding guests and afternoon tea fanatics for a few decades. Made popular in France, one can see extreme examples of this trend, with hair piled absurdly high, supported by wire framework. The silk ribbons were part of the Frelange gear and were referred to as ‘Fontange’. Twisted and ruched, they were as decorative as icing on a cake. The 2 female subjects have chosen a more subdued version of the Frelange, but it still would have required the assistance of a skilled personal maid. Their hair was probably powdered to look more grey. Green silk "mantua" with gold threads and fringed hem. Sounding ever so Spanish, but likely derived from the french “manteau”, the mantua was an au courant style of dress at the time of the sitting. Popular for several decades, it eventually evolved into a caricature of itself with huge rectangular crinolines and tight stomachers. The version in this portrait was relaxed, but it did have a long train with a fringed hem (see the cat snuggling up to the fringe). There is a blue version and a green version of the mantua, both constructed of sumptuous Chinese silk. Fortunately for the lady on the left, Scheele’s Green, an arsenic-based dye, had not yet been invented. It is likely that copper or vegetable dyes provided the bottle green hue. Gold threads were woven through the body of the mantua to display wealth and to reflect the soft light of beeswax candles which lit the interiors in the evenings. Wigs were a status symbol in the 18th century. The trend though, began a hundred years earlier when syphilis was rampant throughout Europe and men suffered hair loss and open sores as a result. The “peruke” or periwig, hid these embarrassing symptoms and became a social necessity, establishing a brisk trade for wig makers. A wig such as the one above would have cost at least half a year’s wages for the average Londoner. By the time this portrait was painted, wigs were a fashion rather than an attempt to hide a disease. They were made of a combination of horse hair, human and goat hair and dusted with aromatic powders. They would be taken periodically to the wig maker for cleaning and de-lousing. The formality of wig wearing lasted through the century, eventually going out of fashion after the French revolution. The Jingdezhen kilns in Jiangsu Province, China, produced massive amounts of blue and white porcelain for export to Europe in the 17th and 18th centuries (Qing dynasty). Porcelain was often used for ballast on ships that carried lighter weight luxury goods such as silk and tea. The elusive recipe for porcelain had only just been discovered at the Meissen factory in Germany in 1710, but the “arcanum” was fiercely guarded and it would be decades before porcelain factories were established in England. Blue and white porcelain was regarded as a treasure – translucent, delicate but durable, able to take hot liquids without cracking – and brought out for occasions such as this. The little tea bowls had no handles and sat in deep saucers. Tea was sometimes sipped from the saucer. Notice the waste water bowl – it appears to have a crackle glaze, but actually you are looking at the cracked glaze of the painting itself. There are sugar bowls on the table. 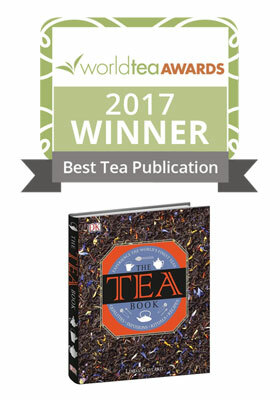 Even though tea was expensive and highly treasured, it probably tasted a bit funky, having travelled in damp cargo holds of ships, on a trip that could last over 8 months. The taste would be improved with the addition of sugar, which was marketed and promoted by British sugar plantations in the West Indies. It was pretty neat to spot a Yixing 宜興 teapot sitting near the hostess on the tea table. These tiny teapots have been part of tea culture since the 16th century (early Qing dynasty). They are also sometimes referred to as Zisha 紫砂, meaning purple sand, referencing the brownish/purple colour of the clay which is found only in the Yixing area of Jiangsu Province. The clay is highly plastic and can be formed into teaware by hand building. It is fired and burnished, but left unglazed. This pot is quite small in size, holding enough loose leaves for several rounds of serving. All the tea consumed was from China. Tea cultivation in India wouldn’t begin for another 140 years. Teas under lock and key in the tea chests of the privileged had unusual names that are mostly unfamiliar to us today. They are likely bastardizations of the Amoy dialect (Fukien/Fujian Province) used by the local tea traders and mispronounced by the English buyers. This painting measures 63.5cm by 76.2cm (25″ by 30″), a moderate size for hanging in the home. During this era of portraiture, the sitters might have been required to sit for a total of 4 days over a period of time. Once the sitting was complete the artist might have taken up to a year to finish and deliver the work. Payment was usually dependent on approval from the client. The setting and arrangements were carefully chosen. 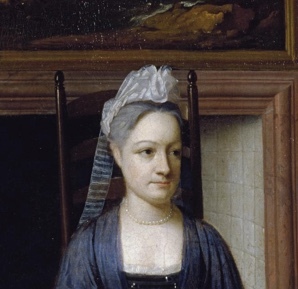 I wasn’t able to determine for fact, the arrangement of sitters, but since the eye goes to the middle subject first, I assume that she was the lady of the house. The officer on the right, may have been her husband and the lady on the left, her sister or mother (hard to tell). What is most peculiar to me is the activity of madame’s hands at the very centre of the painting. When I examined this picture 5 years ago, I noticed madame pinching a bit of tea from a small box. Because the picture quality was low, I wasn’t able to see the detail. This time, with improved resolution, it jumped out at me – madame was in fact pinching snuff! Snuff consists of finely ground, scented tobacco leaves. It is sniffed through the nose from the back of the hand or between thumb and forefinger or with a small implement. The user would have experienced a “buzz” from the nicotine. Snuff was at the height of fashion when this portrait was painted. Queen Anne (1702 – 1714) had a room built in her palace just to house her collection of snuff. It seems there were no social restrictions on women partaking of this addictive habit. This may be the only painting of this era that shows tea and snuff being enjoyed at the same time. 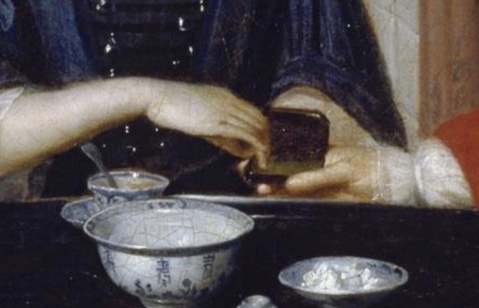 Madame’s pinch may simply have been an affectation contrived by the artist, but it may also have been a symbolic gesture to illustrate the respect of husband to wife via the sharing of snuff. 1715 was early in the Age of Enlightenment, when woman were questioning their position in society – it was clear that they still had no rights to property, etc., but this little gesture could have been a sign – or am I reading too much into it?? What is clear to me now is that this portrait was a big deal to the sitters – they wore their finest attire, had their hair done, got their wig cleaned, wore pearls, got out the good china, unlocked the tea chest, endured hours of sitting and enjoyed a little snuff. Not exactly a moment frozen in time, but rather a lifestyle on display, staged and tweaked to perfection.